Of 220 children referred for suspected hyperactivity, 55 were put on a 6-week trial of the Feingold Diet. 40 of them — 72.7% — exhibited improved behavior, and 26 of them — 47.3% — remained improved following “liberalization” of the diet over a 3-6 month period. Rowe suggested that this may indicate a rather large placebo effect. NOTE: This is not a placebo effect; it is learning to make better choices — usually enough for a person not highly sensitive. What Rowe called “liberalization” involved reintroducing the eliminated foods or additives one at a time, which is the way the usual Feingold Diet works upon entering Stage Two. Any item that provoked symptoms would be left out of the diet again. 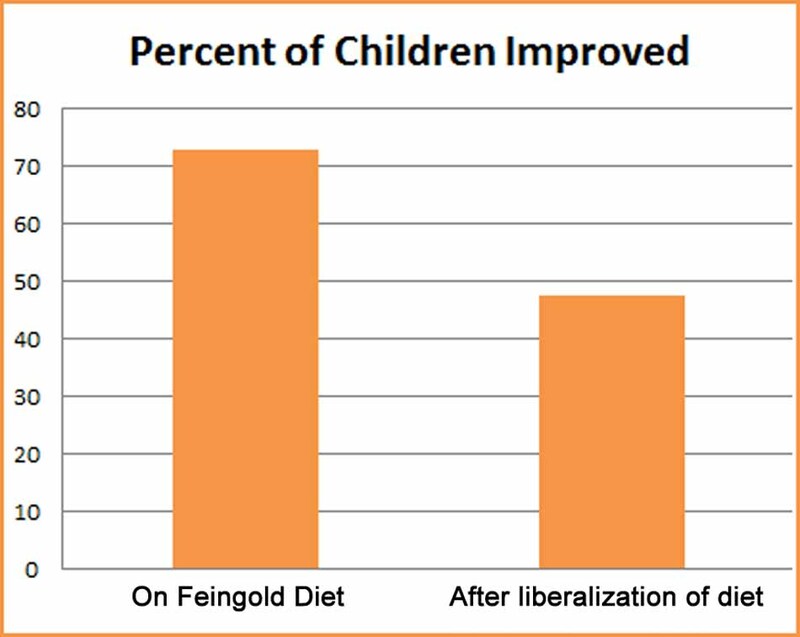 Without appropriate guidance, apparently, more than 20% of the families overly-liberalized their diets or abandoned them altogether, no longer showing improvement. For those who remained improved, I would suggest that they never really went back to their original base-line diet but rather integrated “clean eating” into their previous diet, not reintroducing those additives or items that they experienced clear reactions to. I have met many people who had spent time strictly on the Feingold Diet, later tolerating a more liberal but still basically natural diet, without requiring the Foodlist or any other strict guidelines. Sometimes they come back to the Feingold Association after some years when they realize that they have strayed too far and need updated information; sometimes they have improved sufficiently and gained sufficient expertise to continue to go it alone. NOTE: The study goes into detail about the deficits in the parent questionnaires used, pointing out that the behavioral changes associated with food dye exposure were often irritability, restlessness, and sleep disturbance rather than simply attention deficits. This led to development of the much more sensitive Rowe Questionnaire used in their later studies. A second double-blind study was done on 8 of the children in the original group, to test their reaction to 50 mg of Yellow 5 or carmoisine (a red color not used in the US). They were given capsules containing either the coloring or a placebo inside an outer capsule containing lactose. Two of the children were dramatic reactors to the dyes – one boy, in particular reacted to the coloring with extreme and dangerous behavior described in the study, and it was weeks before his behavior returned to normal, while the female reactor returned to normal within a few days. This entry was posted in 1986-1990, ADHD, Diet Studies, Hyperactivity, Research Studies, Uncategorized. Bookmark the permalink.